Let's take a look at the prophecies God gave Daniel about the end times, especially concerning "the Times of the Gentiles." Two years after Daniel's arrival in Babylon, when he was about 17 years old, God gave Nebuchadnezzar a dream that greatly disturbed him. The king demanded that his wise men tell him two things — first, what he had dreamed and second, the meaning of the dream. Needless to say, the wise men were confounded. 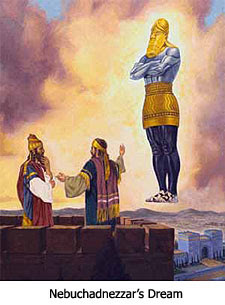 In chapter 2, beginning with verse 31, Daniel begins to reveal to Nebuchadnezzar both his dream and its meaning. He tells the king that in his dream he saw a magnificent and awesome statue with a head of gold, a chest of silver, thighs of bronze, and legs of iron. The feet of the statue were made of a mixture of iron and clay. He reminded the king that as he was admiring the statue, a large stone suddenly appeared — a stone that had not been cut by human hands. This supernatural stone suddenly struck the feet of the statue and the entire statue was destroyed. The stone then quickly grew into a great mountain that "filled the whole earth." It is a period of time that the Bible refers to as "the times of the Gentiles" (Luke 21:24). It begins with the fall of the last king of Judah, Zedekiah (586 BC), and will continue until Jesus returns and re-establishes the throne of David in Jerusalem. The first was a lion that had the wings of an eagle. The second was a bear that was raised up on one side and had three bones in its mouth. 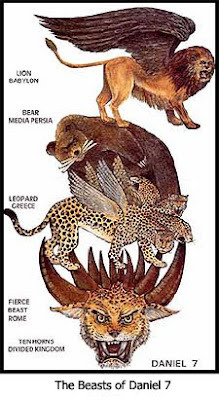 The third was a leopard with four heads and four wings. The fourth was a beast which Daniel described as "dreadful and terrifying and extremely strong." It had large iron teeth and ten horns. What Daniel is seeing in this dream is the same succession of world empires that Nebuchadnezzar saw in his dream. The difference is that Nebuchadnezzar saw them from Man's viewpoint, as something magnificent and glorious. God reveals them to Daniel as He sees them — a series of ravenous beasts. As Daniel stares in horror at the last beast, he suddenly notices that another horn — "a little horn" — rises up among the ten horns and pulls three of them out by their roots. This little horn has the eyes of a man and a mouth that is uttering "great boasts." In verse 24 of chapter 7, Daniel is told that the ten horns represent ten kings and that the little horn will subdue three of them and will then begin to speak blasphemies against the Most High God. This is the first appearance in the book of Daniel of the Antichrist who will head up the last Gentile Empire that will encompass the whole world. The fact that the last empire of 10 horns grows out of the head of the fourth beast is a clear indication that the final Gentile empire will begin as a revival of the old Roman Empire.